Click the magnifying glass icon near the top-left side of the screen to show or hide the search panel. 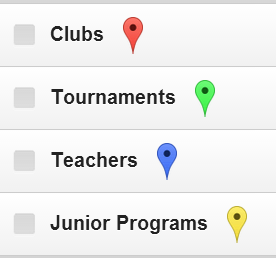 Use the "Quick location search" box at the top of the search panel to quickly see all results in a city or ZIP code. Simply begin typing and select an option in the suggestions box. After you check the box, the section will expand to reveal more search options and filters for that category. 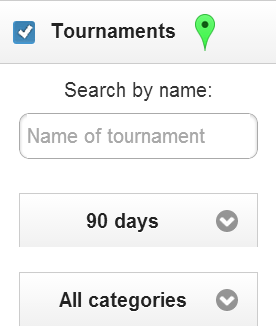 Most searches start automatically after you change any item in the form. To manually start a search, press the Enter key or click the search button at the bottom of the panel. Expand the "Advanced location search" section to see several options for more flexible, powerful location searches. Note: These options will override what's in the "Quick location search" box. Want to share the results? Copy the share link at the bottom of the search panel, and share the URL with your friends. This will link directly to the search results you're currently viewing. Quick location search: Note: Marker locations are approximate. 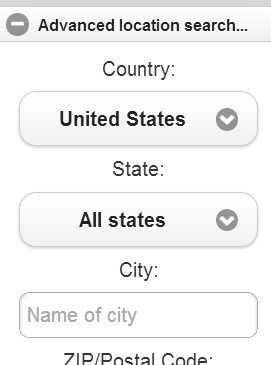 Click on a marker to view address info for a specific result (if available).